The strange curvature of this club looks like some of my past clubs after I thumped them against a tree. Yet now it seems the company is putting a new type of technology together where the center of gravity -- and I quote -- "actually exists in the air behind the face." Mmmm-kay. That's new. Now even my sweet spot exists somewhere in space? Sure, I swung them. Sure, I hooked a few. (Sorry, I know it's traditional to slice, but I come over the ball too much naturally. It's a gift.) Sure, it took me a while to get used to the style. Another reason for my hook was due to the offsetting of the golf club. That means the hosel is bent a little bit so that the clubface is closed. This is designed for beginners who have trouble squaring the clubface. If you are like me and you have already taught yourself to throw the club over your right shoulder like you are driving spikes into a railroad, and then you pull it from outside to in with the face closed – well, it turns out the ball goes straight left. The irons are large with big faces. They look more like tennis rackets than golf clubs. If you can manage to miss the ball with this pitching wedge, then you might want to think about taking up bowling. 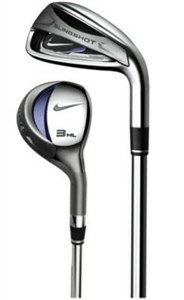 It has a cavity back weighting which makes the sweet spot big and it covers almost the entire clubface. That means you don’t have to hit is right in the middle of the club for it to fly at the target. On my old set of clubs when I hit it out on the toe the ball wouldn’t go farther than the lady’s tee. However, one thing amazed the crud out of me every time I hit one -- even on a mishit, that the ball took off like superman… Up, up, and away, baby. These clubs have a very interesting weight management system that truly gives a deeper sole on impact -- and the result is a very high trajectory… Like crazy high. It was definite confidence booster. This might just be a great set for someone newer to the game -- giving them the encouragement that we all need when starting the game. I should also mention that the price of this set is very reasonable. I’m not use to seeing that about anything with a swoosh tatted on it. But this set is very easy on the wallet, and it might give a newer golfer a few of those "shots to remember" and keep them coming back more often. Of course, that means fewer tee times for me... ugg.